As MOOCs grow in influence and sophistication, they’re no longer simply reimagined in a Harvard classroom or even in a nearby studio. Recently, transforming a residential course — going digital via HarvardX — included filming in far-flung Rwanda and Haiti. Increasingly, professors are going to great lengths to ensure that the intellectual heft of the original class is maintained or even enhanced in a massive open online course, even if that means going halfway around the world to film material. That was the case with “Global Health: Case Studies from a Biosocial Perspective,” which looks at international health problems within their social and political contexts. The course was developed by Arthur Kleinman, Esther and Sidney Rabb Professor of Medical Anthropology in the Faculty of Arts and Sciences, and Paul Farmer, Kolokotrones University Professor of Global Health and Social Medicine at Harvard Medical School (HMS), and is currently taught by them with HMS’ Anne Becker, Maude and Lillian Presley Professor of Global Health and Social Medicine, and Salmaan Keshavjee, associate professor of global health and social medicine. As HarvardX project lead April Opoliner explains, the nature of the course is unique to Harvard. “It’s different from most global health courses in that it’s taught by four physician-anthropologists,” said Opoliner, who helped the faculty translate their vision as a combination digital producer, instructional designer, and content manager. Opoliner also has a doctorate in public health. The trip to Haiti in December 2013 was one way of spelling out the mission to integrate social and political issues with health care. The Harvard on-site team — Farmer, Becker, Opoliner, and a videographer — spent a nearly 48 hours straight doing interviews and gathering footage. 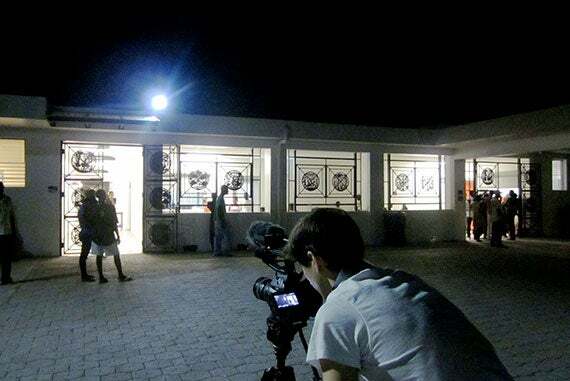 HarvardX videographer Alex Auriema shooting in the dark outside of Hôpital Universitaire de Mirebalais in Haiti. There are skilled and talented doctors in Rwanda, Opoliner notes, who would be more inclined to stay and practice in their home country if the infrastructure and support system were in place. These found stories are finding a wide audience. Since the course went online, it’s been taught at other universities. Medical students in Rwanda have taken it, and it was used in medical courses at the University of Giessen in Germany. “They used our course in innovative ways, watching our lectures and carrying that into their classroom discussion. They saw the MOOC as an important teaching tool,” says Keshavjee. 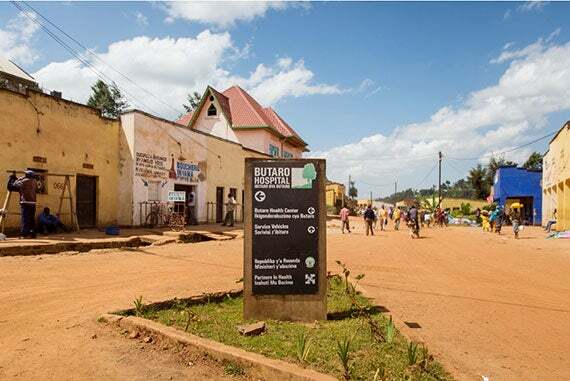 Many might find it surprising that the level of care at Butaro Hospital in Rwanda, featured as part of a case study in a MOOC led by Arthur Kleinman, is on par with hospitals in major cities like Boston. One advantage of the MOOC is that digital materials can be incorporated to show a variety of perspectives. Becker points to a lecture she gives on global mental health, how teachers are being trained to recognize signs of mental illness and help the students navigate toward care. That richer perspective has found its way to Harvard Yard as well. While the MOOC materials are not yet part of the standard curriculum for the course, they’re available to students as supplemental material. To measure how well the points got across, Opoliner cites an online survey in which the MOOC learners were asked to give the first word that came to mind when thinking of global health care. Students in more than 100 countries have earned certificates of completion for the MOOC. While many are studying medicine, others are in law or related professions. And as Keshavjee points out, not everyone who will work in health care is a doctor, and the issues raised in the course can be applicable beyond medicine. Those tuning into that message include amateurs and experts, and even a leader of a Harvard School. David Hunter, acting dean at the Harvard T.H. Chan School of Public Health, whose MOOC for HarvardX will launch in November, expressed pride in his certificate of completion for the course. It is framed in his office. This month, Bob Schieffer begins a three-semester appointment as the Walter Shorenstein Media and Democracy Fellow at the Shorenstein Center for Media, Politics, and Public Policy at Harvard Kennedy School, where he will focus on the 2016 presidential election. Photo by Craig Blankenhorn/© CBS Broadcasting Inc.